Senior quarterback Peter Pujals threw five touchdowns passes to four different receivers as the Holy Cross football team posted a 51-26 victory over No. 9 New Hampshire at Fitton Field. The win was the Crusaders’ first over a Top 10 opponent since the 2005 season. The Wildcats opened the scoring at the 9:03 mark of the first quarter on a six-yard touchdown pass from Trevor Knight to Neil O’Connor. Holy Cross stormed back to score the next 16 points and take a 16-7 lead into the locker room at halftime. Pujals threw a 14-yard scoring strike to junior wide out Martin Dorsey, while senior placekicker A.J. Wells booted field goals of 46, 29 and 37 yards. Pujals added touchdown passes of six yards to junior tight end Derek Mountain and 15 yards to senior wide receiver Blaise Bell after the break, and senior wide out Andre Harton scored a 20-yard reverse as the Crusaders took a 37-13 lead in the third quarter. The Wildcats would get no closer than 18 points the rest of the way as Holy Cross pulled away for the victory. 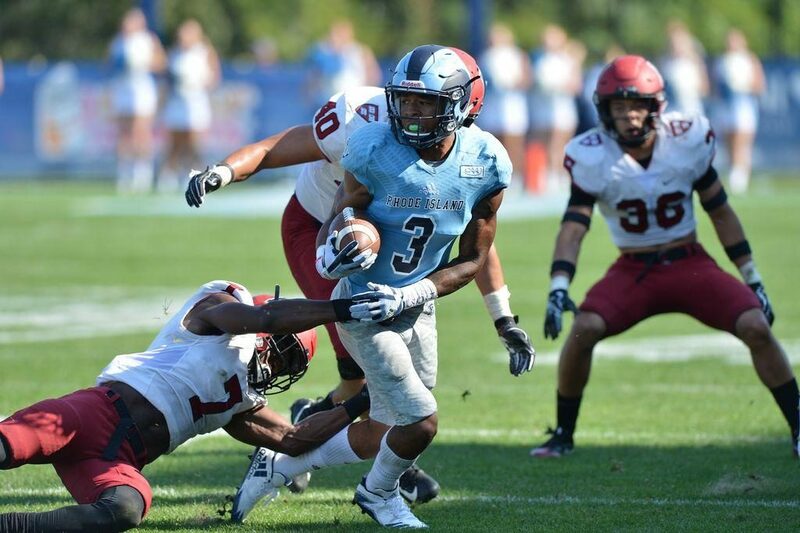 Rhode Island picked up its first win of the season Saturday at Meade Stadium, defeating Harvard 17-10. The victory – which is URI’s first-ever over Harvard – marked the Crimson’s first loss in a season-opener since 2011. Harvard moved down the field in the final minutes of the game, using its timeouts to preserve the clock and try to get in the endzone. With two third-down conversions and a fourth-down conversion, the Crimson’s final chance came at the URI 25 with seven seconds remaining. Joe Viviano’s final pass went incomplete through the back of the endzone as the clock expired, giving Rhody its first win of the season, and its first-ever win over Harvard in program history. Malcolm Summers ran for a career-high 178 yards on a personal-best 30 carries and scored one touchdown and the Elon University football team survived a last-second field goal attempt to defeat the 16th-rated Charleston Southern Buccaneers by a 19-17 margin at Rhodes Stadium on Saturday, Sept. 16. With the victory, Elon’s first in a home opener since 2013, the Phoenix improved to 2-1 on the year. The loss dropped the Bucs to 0-2. Whether it is Boone in 2013 or Kent, Ohio in 2016 or the North Carolina A&T football team’s latest conquest in Charlotte on Saturday night, the North Carolina A&T football team has become adept at going on the road and winning games conventional wisdom says they cannot win. The game of the week that wasn’t. South Dakota dominated 10th-ranked North Dakota from start to finish, outgaining the Hawks 575-257 and rolling to a 45-7 win Saturday inside the DakotaDome to improve to 3-0 for the first time since 2006. The Coyotes, No. 23 in the polls and climbing, won their 15th consecutive home opener dating back to 2003, and improved to 34-5 in home openers in the Dome dating back to 1979. While the game wasn’t included in the quest for a fourth straight Sgt. York Trophy, the University of Tennessee at Martin football team showed no hesitation in displaying its in-state dominance a week early with a 21-7 road victory over No. 15 ranked Chattanooga on Saturday night. The Skyhawks (2-1) controlled the game from start to finish, scoring on the team’s second drive of the game, building a lead as large as 21 points and never looking back down the stretch. Hitting the road for the second time this season, the Skyhawks notched their first win over a ranked opponent of the season, while picking up their first upset over a top-15 program since defeating No. 7 Central Arkansas in 2013. The Grambling State University football team scored a pair of fourth-quarter touchdowns to pull away from Jackson State in a 36-21 victory on Saturday night at Eddie G. Memorial Stadium. The Thunderbird football team opened their home season with a bang on Saturday evening, as they upset the No. 18/21 Panthers of Northern Iowa 24-21 with a game winning field goal in the final minutes of play. The Thunderbirds played in front of 8,841 on Saturday evening. After a blocked field goal attempt by the Thunderbirds, Southern Utah drove the field and freshman kicker Manny Berz knocked home the game winning field goal. Jalen Russell intercepted Dunne as Northern Iowa heaved the ball for one last try, which sealed the game and gave SUU a 24-21 victory. The Idaho State football team knocked off Nevada 30-28 on Saturday evening at Mackay Stadium. The Bengals led the entire game and fought off a late Wolf Pack rally to earn the victory. The victory is first win over an FBS team since beating Utah State 27-24 in 2000. The Bengal defense forced three turnovers. Idaho State finished with 383 total yards while Nevada had 423. Sophomore safety Alize Ward intercepted Incarnate Word’s Sean Brophy on a flea flicker pass with 16 seconds remaining and returned it 70 yards for a touchdown as time expired, lifting Stephen F. Austin to a 37-31 victory in the Lumberjacks’ Southland Conference opener. Trailing 31-21 with under nine minutes left, SFA (1-2, 1-0 Southland) scored 16 unanswered points in the final eight and a half minutes of play to top the visiting Cardinals (0-3, 0-1 Southland).